Now that I've spent no less than three posts waffling about all the things I love about Jedi Under Siege's story, it only seems fair to also give the environmental artists and level designers their due, because Ossus is both beautiful and fun to spend time on. It's not just pleasing to the eye (to be honest I feel that most of the planets added after launch have been), but it also has a very "vanilla" feel to it. I think the main reason for this is how vast and open it is. I'd say it's probably similar to Yavin IV in size, which isn't huge, but the quests are very widely distributed across the area. I can understand why this "larger than life" design might not be everyone's cup of tea, but personally I really like it because it kind of serves as a counterpoint to the game's "theme-park-ness", which is to say that while SWTOR likes to take us through very tightly directed stories, having large and open zones at least makes the planets feel like actual worlds instead of as if they were just designed to serve as set pieces for the quest narrative. In practice this means that doing the daily quests requires quite a lot of running around, but unlike on Iokath the whole thing flows very well, so it doesn't feel annoying. The missions themselves are all fairly run-off-the-mill in their gameplay (kill X, click on Y), but again: that's fine. Personally I don't mind Bioware experimenting a bit now and then, like they did with the puzzle and vehicle sections in KotET, but these things can be divisive, whereas you can't really go wrong with simply giving people more of a thing they already like, which is to say an opportunity to use their beloved characters' skills. About the most annoying thing is that a lot of objectives are limited to a fairly small area or even to just one specific mob, and with the oodles of players all trying to get their quests done at the same time the amount of competition can be aggravating. Personally I've been dealing with that by questing in the PvP instance most of the time. I also have to give a special shout-out to the new heroic missions on Ossus. I've found the [Heroic 2]s to be easily soloable, but the [Heroic 4] definitely requires you to bring a friend (or make one). I've actually done all of them in groups though, simply because it's so easy! 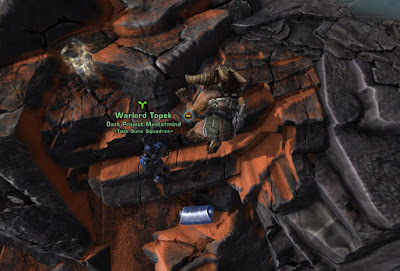 With how busy it is on the planet you can just post a shout-out in general chat and usually get a response instantly, but even if it takes a couple of minutes you can simply do some of the solo missions while keeping an eye out for other people interested in grouping. The automatically granted quick travel item also comes in handy (and is the main reason I've also done the [Heroic 2]s in a group sometimes to be honest), because it allows everyone to instantly get to the right place and get going. This is the kind of thing I had been hoping for when Bioware added the existing heroics to the fleet in 4.0 and added those quick travel items in the first place... before I realised that they'd obsoleted any grouping requirements in the process as well. Another great thing about Ossus is that it has content beyond just the main storyline and its associated dailies. For example there are some hidden achievements to be chased and new datacrons to be found. I haven't actually bothered with these myself yet - while I already had guildies offering summons to the datacrons during the first week, I politely declined those as I wanted to at least have a closer look at them myself first. I like the idea of there being some extra content for me to check out later at my leisure instead of everything being more or less done once I've completed the quests. There are also random security chests hidden in certain spots that contain more of the relic currency and are therefore worth picking up. Finally there are the world bosses, and I'm delighted every time I see people forming groups for them. The weekly mission for a masterwork crystal means that they are currently in high demand, so just like with the heroics it's super easy to find other people to do them with. You can basically bring up general chat at pretty much any time of day and find someone in the process of forming a group. (I joined one of these at something like 11pm on Christmas Eve and one of the group members complained about the slowness of the process because it took longer than five minutes to fill the group.) You just whisper the leader to ask for an invite and then you can pretty much continue with your business until the group is full as someone will usually throw out a guild ship summon anyway once you've hit the maximum amount of players. Both bosses are good fun, which is to say they have fairly straightforward mechanics without being boring tank-and-spanks, and handily support a role distribution that seems to mesh well with players' natural preferences, which is to say that you only need 1-2 tanks, about 4 healers, and then you're best off filling the other available 18-19 slots with damage dealers as both bosses have a lot of health. This contributes to groups filling up quickly and hassle-free, though it does worry me a bit in terms of how viable it will be to revisit these bosses once Ossus isn't the new hotness anymore. My only real gripe is that the game's engine doesn't deal well with such large numbers of players, and especially when fighting Kil'Cik (the bug boss), the large group size combined with his endless add summons tends to turn the experience into a slide show for me. On R8-X8 (the droid boss), pugs usually do a lot of dying and zerging (fortunately the respawn point isn't far away) but it feels like this is mostly due to us as a community still not really understanding the fight (yet). For example I still don't know how/when you can actually interrupt him. One of his buffs states that normal interrupts don't work, but as for what qualifies as special enough to interrupt him anyway, I've seen theories from needing a certain number of people to interrupt at the same time to the dedicated interrupter needing a special buff (but nobody could say what it is or how to get it). Likewise I've repeatedly seen the advice to avoid blowing up the fuel barrels, however my guild found that doing so is actually a good thing as it's easy to avoid the resulting explosion, and no fuel means that the droid can't re-fuel, and once he hits zero fuel he stops doing Incinerate (his most deadly ability) entirely. Anyway, what I'm saying is that there are plenty of things going on on Ossus to keep players engaged, with a lair boss scheduled to be added in the next patch as well, and I've actually been enjoying taking multiple characters there to get my reputation up and earn new rewards in a way that I haven't done in years. Thanks, Bioware! Imps "go splat". Love it. Perfectly balanced. As all things should be. For the Republic! Ossus is nice indeed. 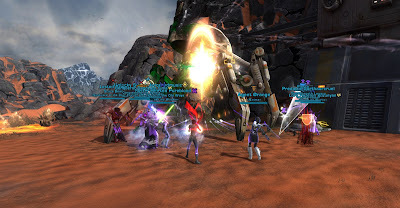 Though personally I'm still hoping for Bioware to let us go back to Dantooine one of these days. Exploring the old enclave similiar to the ruins of Taris. I always liked the look of that planet, and I feel it would look stunning if updated. Hm, I'm afraid I can't share that particular desire. 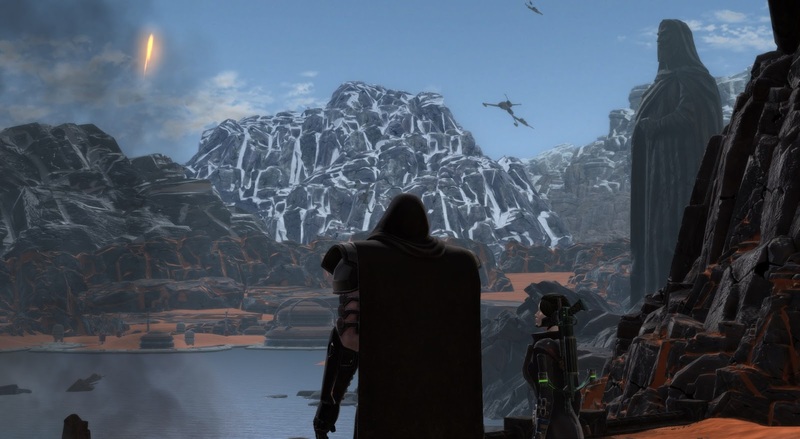 I only played KOTOR for the first time two years ago, and back then Dantooine struck me as the blandest/most boring planet in it. It's just brown steppes with a few scattered trees on them, isn't it? Disagree, Dantooine is not bland or boring. It's awesome! Now Alderan, Belsavis, Voss, Taris, Nar Shadda, Dromund Kaas. Yes. Hi have you ever done a post on ranking the planets using metrics like how good it looks. How much fun the missions are and maybe the layout. I think this would be very interesting but would maybe require a hell of a lot of work. Just a thought. Also, my friend Cal made some very comprehensive posts about his top 5 most beautiful planets and top 5 planetary quest chains in the past if you've never read those.